The Ancient City of Polonnaruwa, designated a World Heritage Site by UNESCO in 1982, provides an enlightening view of life in Sri Lanka's capital city from 1070 C.E. to 1310 C.E. The seat of power for the Polonnaruwa Kingdom, the king Parākramabāhu I designed and built the city utilizing techniques of irrigation and reservoirs. Parākramabāhu I understood the importance of water to sustaining his kingdom, and made effective irrigation a priority. The kingdom needed the ability to withstand invasions from a succession of southern India dynasties. Powerful Indian navies and armies supported campaigns outside the India subcontinent. The kings of the Anuradhapura Kingdom moved their capital inland to Polonnaruwa in the hopes of averting being taken over by invading Chola armies. The Chola Dynasty was a Tamil dynasty that ruled primarily in southern India until the thirteenth century. A great deal of the credit for establishing the Polonnaruwa kingdom, and the capital city of Polonnaruwa, as a powerful dynasty goes to Parākramabāhu I. Resisting the powerful Chola dynasty required planning and organizing. For nearly 300 years, the strategy of an inland capital at Polonnaruwa worked until around 1300 C.E. when invasions from Southern India could no longer be resisted. The Sinhalese kings moved the capital to Yapahuwa and Polonnaruwa, like so many capitals in ancient India and Sri Lanka, was abandoned. 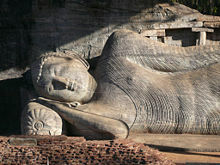 Buddhism played an important role in the culture of Polonnaruwa. Gal Vihare, a rock temple to Buddha in Polonnaruwa, was constructed by Parākramabāhu I during the 1100s. His craftsmen carved four huge Buddha statues into a granite wall. One Buddha figure posed in reclining position measures 46 feet (14 m) long and a standing Buddha statue measures 23 feet (7.0 m) tall. Another statue in the shrine Parākramabāhu depicts Buddha's chief disciple, Ananda. One of the Buddha statues is said to display an expression of sorrow, an expression uncharacteristic for Buddha depictions. Polonnaruwa, the second of Sri Lanka's kingdoms, became the capital city in 1070 C.E. under the rule of King Vijayabahu I. He defeated the invading Chola armies, reuniting the country. During Chola's short reign, Polonnaruwa had been called Jananathamangalam. While historians consider Vijayabahu's victory, and the shifting of Kingdoms to the more strategic Polonnaruwa, significant, his grandson, Parākramabāhu I receives much credit for building Polonnaruwa. Parākramabāhu I's reign marked the Golden Age of Polonnaruwa, when trade and agriculture flourished under his patronage. The king directed that rain water would be used to irrigate crops, directing the creation of irrigation systems superior to those of the Anuradhapura Age. Those irrigation systems still supply the water for paddy cultivation during the dry season in the eastern part of the country. The largest of those systems, the Parakrama Samudraya or the Sea of Parakrama, constitutes a tank that people often mistaken for a sea. The tank has a width such that a person standing on one shore can not view the other side. It encircles the main city, serving as both a defensive border against intruders and the main source of water during peace time. The Kingdom of Polonnaruwa enjoyed complete water self-sufficiency during King Parākramabāhu's reign. With the exception of his immediate successor, Nissankamalla I, the other monarchs of Polonnaruwa had been less effective leaders, suffering from dissension within their courts. They formed matrimonial alliances with the stronger South Indian Kingdoms, those matrimonial links superseded the local royal lineage. That gave rise to King Kalinga Magha's invasion in 1214. 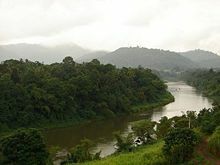 That invasion set the stage for a Pandyan King to take the throne following the Arya Chakrawarthi invasion of Sri Lanka in 1284, the capital shifting to Dambadeniya. The Polonnaruwa Kingdom existed from eighth century until 1310 C.E. After ruling the kingdom for over 1200 years as the Anuradhapura Kingdom, Sri Lankan kings decide to move their capital to Polonnaruwa, hoping that the distance further inland from Anuradhapura would allow more time to organize defenses in times of foreign invasion. Polonnaruwa had previously been an important settlement in the country as it commanded the crossings of the Mahaweli Ganga towards Anuradhapura. Most of the remains of Polonnaruwa date from after the 1150s, as the extensive civil wars that preceded Parākramabāhu I's accession to the throne devastated the city. The Polonnaruwa Kingdom had been abandoned in the fourteenth century, and the seat of government for the Sinhalese kings moved to Yapahuwa. Although many factors contributed to that, south India's ability to launch invasions upon the city had been the leading cause for the abandonment of Polonnaruwa as the capital city of Sri Lanka. The Gal Vihare refers to a rock temple of the Buddha in Polonnaruwa. Parākramabāhu I constructed the temple in the twelfth century, his architects excavating the shrine and leaving an inscription describing their work. Four large statues of the Buddha, carved into the face of a granite boulder by Parākramabāhu's architects, constitute the central attraction of the shrine. Those include a recumbent statue of the Buddha measuring forty six feet and a standing statue twenty three feet in height. Historians have identified a standing figure on a lotus throne located in the shrine Parākramabāhu I as Ananda, the Buddha's chief disciple, weeping over the recumbent figure of the Buddha who has just attained Nirvana. Some historians, including Andreas Nell suggest that the expression of sorrow on the Buddha's had been created by the natural elements ware upon the stone. A small town has built up around the archeological site of Polonnaruwa engaged in tourism. Government institutions stand in a newly built area called “New Town,” about six kilometers away from the town on the main road. The largest school in the district, Polonnaruwa Royal Central College operates in New Town. Polonnaruwa is the second largest city in North Central Province, considered one of the cleaner and ascetically pleasing cities in the country. The green environment, amazing ancient constructions, Parackrama Samudraya (a huge lake built in 1200 C.E. ), well-rated tourist hotels and friendly local people attract domestic and international visitors. Historically, Polonnaruwa has had a tropical climate most of the year although occasionally experiencing chilly weather in December and January. Recently an increase in rain fall and lower temperatures have been measured. Visitors to Polonnaruwa tend to appreciate the cooler weather although paddy field farmers suffer when their fields experience flooding. The Recumbent statue of the Buddha. 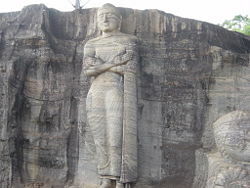 The Gal Vihariya in Polanaruwa had all three postures of the Buddha carved out of a single rock. Polanaruwa ruins: What's left of an ancient library and reading room, at Sri Lanka's second capital city. Tank in Polonnaruwa constructed for the ancient city's water supply. ↑ Walter Nubin, Sri Lanka: Current Issues and Historical Background (New York: Nova Science Publishers, 2002), 103. ↑ John Faithful Fleet, The Dynasties of the Kanarese Districts of the Bombay Presidency from the Earliest Historical Times to the Muhammadan Conquest of A.D. 1318(Bombay: Government Central Press, 2002) 59. ↑ 4.0 4.1 4.2 R. Jones-Bateman, An Illustrated Guide to the Buried Cities of Ceylon (Kandy: Queen's Hotel, 1932, OCLC 363716). ↑ Sri Lanka Ministry of Tourism, The Medieval Capital of Polonnaruwa. Retrieved August 4, 2008. ↑ Richard Plunkett, Brigitte Ellemor, and Verity Campbell, Sri Lanka (Melbourne, Vic: Lonely Planet, 2003), 234f. Abeysinghe, Abeyratna Banda. 1998. Guide to Polonnaruwa. Panadura: Dimuthu Printers. ISBN 9789558096000. Balasooriya, Jayasinghe. 2004. The Glory of Ancient Polonnaruva. Sooriya Printers, Polonnaruva. ISBN 955-8158-01-1. Basnayake, H. T., and Uda Hettige. 2007. Polonnaruwa Civilization. Colombo: Godage International Book Publishers. ISBN 9789552074752. Fleet, John Faithful. 1882. The Dynasties of the Kanarese Districts of the Bombay Presidency from the Earliest Historical Times to the Muhammadan Conquest of A.D. 1318. Bombay: Government Central Press. OCLC 30609559. Nubin, Walter. 2002. Sri Lanka: Current Issues and Historical Background. New York: Nova Science Publishers. ISBN 9781590335734. Paranavitana, Senarat and Cyril Wace Nicholas. 1961. A Concise History of Ceylon. Ceylon University Press, Colombo. OCLC 465385. Plunkett, Richard, Brigitte Ellemor, and Verity Campbell. 2003. Sri Lanka. Melbourne, Vic: Lonely Planet. ISBN 9781740594233. World and its Peoples: Eastern and Southern Asia. 2007. New York: Marshall Cavendish. ISBN 9780761476351. "Discovering Polonnaruwa" - an article in The Hindu. Galvihara - a unique display of rock art. Places of interest in Polonnaruwa. This page was last modified on 30 March 2019, at 21:04.